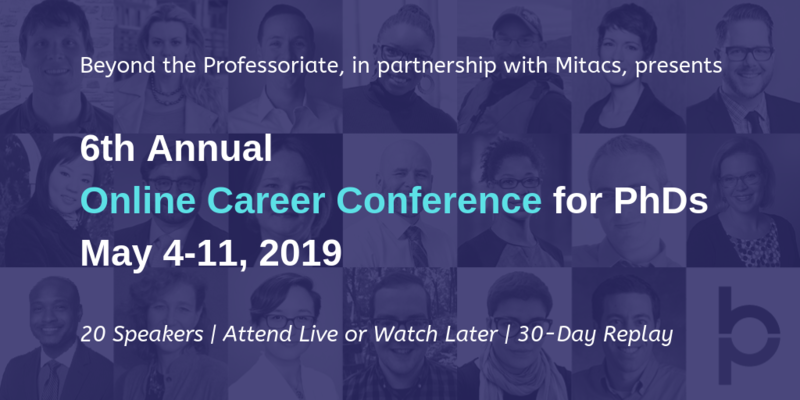 In addition to how-to workshops and panel discussions, this year’s career education conference will include a series of career spotlights from PhDs working in a variety of fields. Maren Wood and I are excited to announce our 6th annual online career conference for PhDs! It’s happening live, May 4-11, 2019. Many thanks to Mitacs for partnering with us again. More details below, but first let me say a few things about the what and why of this fantastic event. Five and a half years ago Maren contacted me about an idea she had: to deliver career education to graduate students and PhDs across North America via webinar technology. She and I knew each other from when we were both Master’s students at Carleton University; now, after receiving our PhDs from the University of Toronto (me) and the University of North Carolina at Chapel Hill (Maren), we discovered we were once again colleagues, each with our own small businesses helping doctoral degree holders navigate challenging career transitions. I thought her idea was awesome, and the conference was born! Our first event was in May 2014, and we welcomed about one hundred attendees to join us for panel discussions and seminars about finding great jobs outside academia. Last year over 600 graduate students, postdocs, and other PhDs registered for our conference. Individuals from across disciplines and over a dozen different countries attended. This year we’re once again presenting how-to sessions delivered by career education professionals who work with graduate students and PhDs every day. That’s happening on Saturday, May 4. Then the following Saturday, May 11, we’re hosting four panel discussions, each highlighting the work doctoral degree holders do in a wide range of fields, in higher education, government, the non-profit sector, and in the business world. We’re doing something new for our 6th annual conference: a series of career spotlights. These will cover exciting career fields including freelancing and independent consulting, biotechnology, UX (“user experience”) research, and policy. Anyone interested in learning more about jobs in these fields can add a spotlight (or two or three or four) to their registration. Demystify the non-academic job search process! Learn successful job search strategies for PhDs from career education professionals. Hear what it’s really like to work beyond the professoriate. Panelists live and work in cities across the United States and Canada and hold PhDs in the humanities, social sciences and STEM disciplines. Learn more about select exciting career paths for PhDs. These sessions are presented by PhDs with years of professional experience in their respective career fields. Katie Rose Guest Pryal, JD, PhD Pryal Consulting, Inc.
Want to attend? Register for the conference on our website. Jennifer Polk is a career coach and entrepreneur. She earned her PhD in history from the University of Toronto in 2012. For more information and resources, check out her website: FromPhDtoLife.com.